"Well," said DeSoto Brown, noted Hawaii pop-culturologist, "the people have spoken. There are no surprises among the top seven sites chosen by Star-Bulletin readers for the Seven Wonders of Hawaii, but isn't that how it should be? They should be obvious to all." Architect and historian Glenn Mason, whom we also dragooned into advising us on potential Hawaii Wonders, pointed out that among the winners, only one site is artificial, a built structure. "Hawaii is clearly a place where the outdoors and nature matter to residents." 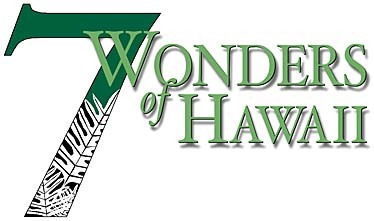 Each day, today through Saturday, the Star-Bulletin will introduce one of Hawaii's Seven Wonders. Save the pages in the print edition and assemble them into an oversized poster. What building is it? Ah, you'll have to wait until it's revealed as the Seven Wonders are presented one by one through the week in this section. However, if your money is on the Reef Runway, you lose big time. Of all the sites nominated, the Reef Runway got the fewest votes, even fewer than H-3. Oops, we just let slip another loser. The site that received the most votes kicks off our series on Page F3 today. The others will follow, in no particular order, on Page D2 each day through Saturday. Collect the pages, and at the end of the week, you can piece them together into an oversize poster. Truly Wonderful. The Seven Wonders of Hawaii are equally scattered throughout the islands, and the top seven outdistanced the eighth-placer by a comfortable margin. Even a posse of superdelegates chose not to alter the final list. Five of our voters will be chosen at random to receive prizes, to be announced next Sunday. Why five? Dunno. It's not like it's a magical number that dominates history, religion, culture, superstition, literature, mathematics and runaway mysticism, like, say, the number seven. No. Choosing Seven Wonders -- choosing seven of anything -- is a process so bound up in classical mysticism that we're incapable of imagining a cooler number. Focus instead on the Wonder aspect. The word itself dates back more than a millennium, back when Old English was spelled "olde," and is coupled in most definitions with expressions like "awe" and "admiration" and "amazement" and "strange" and "surprise." We agree. As you discover the Seven Wonders of Hawaii this week, these are the sorts of inadequate phrases that will come to mind. 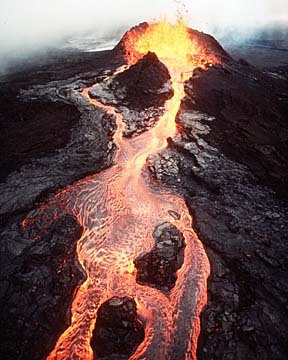 Kilauea's Pu'u O'o vent erupted in July 1983, sending a river of lava from Kilauea's east rift zone. HILO » With a vision of flowing lava still in her mind, a visitor at Hawaii Volcanoes National Park needed to talk about it. "It was so cool. It was red on one side and red on the other side. It was like a little river," the visitor told park volunteer Tina Murty. For another visitor, the experience was almost religious. "I asked the Lord not to take me, at least until I got here. Oh my God. This is even better than I thought," said Corrine Collins of Honolulu. Last year, almost 1.5 million people visited Hawaii Volcanoes National Park, the most popular attraction on the Big Island. Most feel delight in seeing liquid rock and awe at seeing a mile-high plume of gas. But some need guidance. "It can be very overwhelming, all the things we talk about," said ranger B.G. Horvat. Each ranger has a different approach to explaining the volcano, he said. Ranger Joni Mae Makuakane-Jarrell explains it from her na'au -- her gut feeling. Having a background in both Hawaiian culture and geology, Makuakane-Jarrell can provide many answers. But she doesn't announce them. Sometimes she doesn't speak at all. 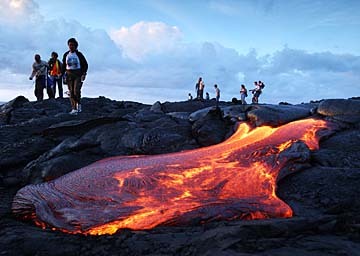 Tourists got up close to lava as it flowed across what was an untouched area of Chain of Craters at sunrise on Aug. 19. When she leads a group from the Visitor Center into a strip of ohia forest, she says not a word. In single file, visitors emerge on the edge of the 3-mile-wide Kilauea Caldera. One by one, in a chain of amazement, the visitors say, "Wow! Wow! Wow!" Now Makuakane-Jarrell asks, Do they see faces in the fumes rising from Halemaumau? They look, rather than let their minds wander. "Why is the fume cloud dark?" she asks Briana Ruiz, 8, of Orange Park, Fla.
Briana thinks it's smoke. Makuakane-Jarrell asks more questions, and Briana suddenly has the answer. It's ash. And the answer is hers because she thought of it. For really attentive people, Makuakane-Jarrell has more. Halemaumau, source of the fumes, means "house of ferns." But why? A volcanologist enjoyed the fiery view of an eruption in 1999. The 'ama'u fern was a manifestation of the pig demigod Kamapua'a, who quarreled with the volcano goddess Pele. Once, Halemaumau, home of Pele, was ringed by the ferns. In 1790 a huge steam explosion blew away the ferns. It also killed part of the army of high chief Keoua, tipping a power struggle in favor of Kamehameha, who went on to become king of all the islands. 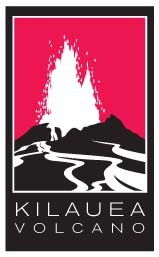 » To visit: The national park is a 2 1/2 -hour drive from Kailua-Kona; 45 minutes from Hilo. Open 24 hours a day; admission is $10 per car. The Visitor Center is the usual first stop for an orientation. Call 985-6000 or visit www.nps.gov/havo. 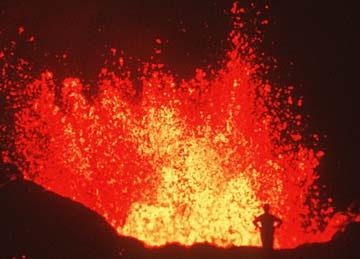 Active lava flows can be seen outside the park, 2 to 10 p.m., by driving on Highway 11 toward Hilo. At Keaau, take Highway 130 to its end. It is an isolated area about 75 minutes from the park. Bring food, water and flashlights.